Cohorts 1 and 2 were analyzed by our in-house cell-based assay (CBA) by transfecting human embryonic kidney cells with GluN1 expression plasmid (cDNA from pENTR223.1-GRIN 1 subcloned in pcDNA3.1+; Invitrogen; V790-20 Life Technologies). Cells were fixed with 4% paraformaldehyde and permeabilized with 0.3% Triton-X100. Cells were incubated with patient serum followed by Alexa Fluor 488–labeled goat anti-human IgG antibody (1:1000, Molecular Probes). A patient with anti–N-methyl-D-aspartate encephalitis was used as a positive control (A) and schizophrenia serum samples from cohorts 1 and 2 were tested. None of the schizophrenia serum samples were found positive (eg, patient 1) (E). Cohort 3 was analyzed by the commercially available CBA from EUROIMMUN following the manufacturer’s recommendations. The positive control from the kit (B) and 2 samples were positive in dilutions 1:10 up to 1:80, a representative picture of the 1:10 dilution from patient 47 is depicted in F. Retesting of the potential positive plasma samples by CBA was performed with the CBA described for cohorts 1 and 2 using a patient with anti-NMDAR encephalitis as a positive control (C) and 1:10 dilution from patient 47, which is negative (G). Scale bars in A-C and E-G = 25 µm. Immunohistochemistry on rat brain was performed with patient serum followed by secondary goat anti-human biotinylated IgG (Vector) dilution 1:2000. In D, the staining was performed using a patient with anti-NMDAR encephalitis (positive control, 1:200) and in H, patient 47 was used (1:200), the results for whom were negative; scale bars in D and H = 500 µm. Patients with anti–N-methyl-D-aspartate receptor (NMDAR) encephalitis usually develop characteristic neurologic and psychiatric symptoms. 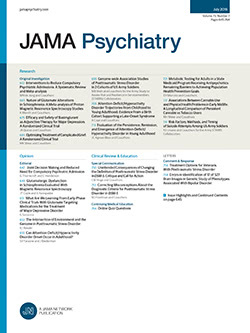 Some patients have isolated psychiatric symptoms, mimicking a schizophrenia-like psychotic episode.1,2 Therefore, it has been hypothesized that a subgroup of patients diagnosed as having schizophrenia actually has anti-NMDAR encephalitis,2 which would have important clinical implications. Anti-NMDAR encephalitis is caused by IgG-type autoantibodies to the GluN1 subunit of the NMDAR. Conflicting reports have been published regarding the seroprevalence of anti-NMDAR autoantibodies in schizophrenia, ranging from 0% to 8%.2,3 Some studies that reported high seroprevalences included patients with schizophrenia with atypical features, such as seizures and movement disorders. We hypothesized that the use of a single antibody detection assay, without any further validation of the findings, may have contributed to the inconsistent findings.3 Here, we investigated the presence of anti-GluN1 IgG autoantibodies in 475 patients with a schizophrenia spectrum disorder and included the cross-validation of positive samples. The current study included 3 cohorts. Cohort 1 involved 415 patients with schizophrenia who were screened over 2 years with a full laboratory screening for studying metabolic changes at the University Psychiatric Center, Katholieke Universiteit Leuven, Kortenberg, Belgium. Samples from this project have been used in the study by van Winkel et al.4 To account for the pleiomorphic clinical presentation thought to arise from mental disorders associated with autoimmune encephalitis, we included cohort 2, which consisted of consecutively admitted patients who initially presented with psychosis and were finally diagnosed as having schizophrenia. These samples were collected at the Erasmus University Medical Center, Rotterdam, clinic for patients with suspected psychotic disorders. Samples from this project have been used in the study by Schwarz et al.5 Cohort 3 was from the Genetic Risk And Outcome of Psychosis (GROUP) Study, a multicenter longitudinal study started in the Netherlands in 2006. Samples from this project have been used in the study by Korver et al.6 The cohorts described in this article were included in 2 different laboratories working simultaneously on the same research question. Approval for this study was obtained from the institutional review boards of Erasmus Medical Center, University Medical Center Utrecht, and EPC KU Leuven; written patient consent was obtained. The Table shows the demographics of the cohorts. In cohorts 1 and 2, no patient sample was positive by CBA (Figure, A and E), whereas the results of 2 of 319 (0.6%) in cohort 3 tested positive in the EUROIMMUN CBA (Figure, B and F). The 2 samples were retested positive when using the same batch of the test and applying gradual dilutions (1:40 and 1:80) (data not shown). Further analyses of the samples in blinded studies by 2 independent laboratories using CBA (Figure, C and G) and immunohistochemistry (Figure, D and H) did not confirm the presence of the autoantibodies. Moreover, retesting the samples with a different batch of the EUROIMMUN CBA in another laboratory was negative (data not shown). We showed that the prevalence of classic GluN1 IgG autoantibodies in the blood of patients with schizophrenia is very rare. Our results do not support the hypothesis that a significant subpopulation of those diagnosed as having schizophrenia are patients with misdiagnosed anti-NMDAR encephalitis. However, most patients with anti-NMDAR encephalitis are initially seen by a psychiatrist and within a month develop characteristic symptoms of the disease, leading to the diagnosis.1,2 When nonfixed cells were used in the CBA, 23% of cases showed antibody-positive results without anti-NMDAR encephalitis (false-positive for this disease)7; in contrast, when fixed CBA and validation studies were used, no false-positive results were found.1 Furthermore, it is known that antibody titers are higher during the acute phase of the disease and the results of 15% of patients test positive only in cerebrospinal fluid.1 The main limitations of the current study were that cerebrospinal fluid was not available in these patient cohorts, most patients had chronic illness, and assessments of neurological symptoms were not available. Therefore, studies investigating cerebrospinal fluid and serum of a large number of acutely ill patients with first-episode psychosis are needed to draw the final conclusions on this topic. This study also demonstrated that the use of a single screening method may yield clinically irrelevant, false-positive results, especially in high-throughput screening with a low prior probability. Positive serum antibody results in patients with psychosis should be confirmed by alternative test methods and/or assays using cerebrospinal fluid samples. Corresponding Author: Pilar Martinez-Martinez, PhD, School of Mental Health and Neuroscience, Maastricht University, Universiteitssingel 50, 6229 ER Maastricht, the Netherlands (p.martinez@maastrichtuniversity.nl). Published Online: May 13, 2015. doi:10.1001/jamapsychiatry.2015.0526. Author Contributions: Drs de Witte and Martinez-Martinez had full access to all of the data in the study and take responsibility for the integrity of the data and the accuracy of the data analysis. Ms Hoffmann and Dr van Mierlo contributed equally to this work. All authors reviewed and approved the final version of the manuscript. Study concept and design: de Witte, Hoffmann, van Mierlo, Kahn, Martinez-Martinez. Acquisition, analysis, or interpretation of data: Hoffmann, van Mierlo, Titulaer, Martinez-Martinez. Drafting of the manuscript: de Witte, Hoffmann, Martinez-Martinez. Statistical analysis: van Mierlo, Kahn. Obtained funding: de Witte, Martinez-Martinez. Administrative, technical, or material support: Hoffmann, van Mierlo, Titulaer, Martinez-Martinez. Study supervision: de Witte, Kahn, Martinez-Martinez. Conflict of Interest Disclosures: Marc De Hert has been a consultant for, received grant/research support and honoraria from, and been on the speakers/advisory boards of Janssen-Cilag, Lundbeck SA, Otsuka, and Takeda Pharmaceutical Industries. No other disclosures were reported. Group Information: The European Consortium of Autoimmune Mental Disorders members include Mario Losen (Division Neuroscience, School for Mental Health and Neuroscience, Maastricht, the Netherlands); Peter Molenaar (Division Neuroscience, School for Mental Health and Neuroscience, Maastricht, the Netherlands); Marc De Hert (University Psychiatric Centre Catholic University Leuven, Campus Kortenberg, Kortenberg, Belgium); Christian H. Roeder (Department of Psychiatry, Erasmus University Medical Center, Rotterdam, the Netherlands); Nico van Beveren (Department of Psychiatry, Erasmus University Medical Center, Rotterdam, the Netherlands); Bart P. F. Rutten (Division Neuroscience, School for Mental Health and Neuroscience, Maastricht, the Netherlands); Jim van Os (Division Neuroscience, School for Mental Health and Neuroscience, Maastricht, the Netherlands); and Pilar Martinez-Martinez (Division Neuroscience, School for Mental Health and Neuroscience, Maastricht, the Netherlands). Funding/Support: This study was supported by a fellowship from the Netherlands Organization for Scientific Research Graduate School of Translational Neuroscience Program (022005019) (Ms Hoffmann); grants from the Brain Foundation of the Netherlands (KS2012-157) and ZonMW NWO Program Translationeel Onderzoek (40-41200-98-9257) (Dr Martinez); a Veni Fellowship of the Netherlands Organization for Scientific Research (916.10.148); a fellowship of the Brain Foundation of the Netherlands (FS2008-28); and a grant from the Prinses Beatrix Fonds (project WAR08-12) (Dr Losen). This study was also supported by an Erasmus MC fellowship, by the Netherlands Organisation for Scientific Research (NWO, Veni incentive 916.14.108), and by the Dutch Epilepsy Foundation (project number 14-19) (Dr Titulaer). Additional Contributions: We thank Josep Dalmau, MD, PhD, ICREA-IDIBAPS, Service of Neurology, Hospital Clínic, University of Barcelona, Barcelona, Spain, and University of Pennsylvania, Philadelphia, for retesting several serum samples in his laboratory and for his valuable advice. Dr Dalmau has a research grant from EUROIMMUN and receives royalties from a patent for the use of N-methyl-D-aspartate receptor antibodies. We are grateful to Jo Stevens, MSc, Department of Neuropsychology and Neuroscience, Division of Neuroscience, School for Mental Health and Neuroscience, Maastricht, the Netherlands, for cloning the human GluN1 in pcDNA 3.1. We also thank Manja Litjens, BSc, Department of Psychiatry, Brain Center Rudolf Magnus, University Medical Center Utrecht, Utrecht, the Netherlands, for her assistance with the experiments and Marleen van Coevorden-Hameete, MD, and Esther de Graaff, PhD, Department of Biology, Division of Cell Biology, Utrecht University, Utrecht, the Netherlands, for valuable discussions and advice. They did not receive compensation for their contributions.